I'm so glad you're here! My name is Beth Genly. I'm pretty sure we have a lot in common, you and I: we are completely dedicated both to our professions and to our families. We care deeply about making the world a better place. Yet, if we don't know how to apply an anti-burnout skill set, that fierce dedication may drive us into burnout: physical, emotional and spiritual exhaustion. Burnout is miserable! I know, I've been there. I was in complete overwhelm. Exhaustion. Frustration. End-of-my-rope hopelessness. So, I truly know: Burnout feels like failure. It also feels almost impossible to talk about. Burnout wrecks careers and relationships. When I went through burnout, I searched desperately for answers. Something that would help me, as an individual, get back to feeling engaged, productive, and connected. Our unique, science-based system helps you start feeling better, fast. 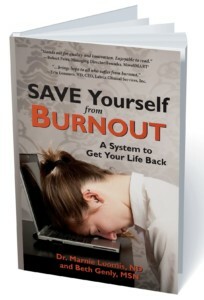 Our book, which details the full system, is called Save Yourself from Burnout:A System to Get Your Life Back. Our fans and clients tell us the photo on the book cover feels deeply personal to them. When you're burned out, you need encouragement and support. You also need clear, effective strategies. At Burnout Solutions, I've got your back. As a health care provider, educator, and entrepreneur, I've witnessed the devastating effects of burnout. I've seen it derail the careers of some of my best and brightest colleagues, students and patients. I've also experienced burnout myself ─ which is how I know it is possible to recover. Are inspirational quotes on Facebook enough to lift you out of physical, emotional and spiritual exhaustion? Not likely, right? Does being asked to find “work-life balance” help you re-engage with your work or your family? Probably not so much, either. Instead, with me you'll learn crucial skills, pulled from the latest research, to help you get back to having the space to breathe and grow in your life. We help you make that vague concept of “work-life balance” into something workable, actionable, and productive. Because this hurting world needs your caring and your skills more than ever. I started Burnout Solutions because there wasn't anything like our system out there. And because I saw too many of my talented, dedicated friends, colleagues and students lose their careers to burnout. Burnout Solutions' unique approach is based on the latest research and best practices in engagement, productivity and connection. I can help you start recovering immediately, and then stay out of burnout, going forward. I am a popular speaker, workshop leader, and personal coach. I graduated with an MSN from the women's health program at Yale University, and practiced as an RN and certified nurse-midwife (CNM) for over two decades. After working at Yale, I spent more than a decade of my healthcare career at OHSU (Oregon Health & Science University) in many roles: clinical practice, teaching, and clinical administration. I've presented to international audiences on the topics of burnout and engagement, business, nutrition and health. These days, my audiences enthusiastically compliment my generosity of spirit and my ability to help people through life’s toughest yet most rewarding moments. I'm married, and we have two absolutely amazing grown children. Our tall, elegant standard poodle, Venice, keeps me honest about meeting my commitment to walk every day. 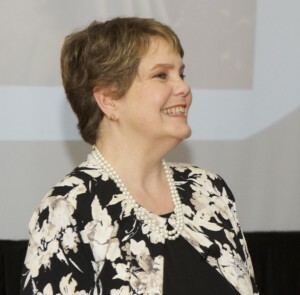 A Special Thank You to Dr. Marnie Loomis, N.D.
Burnout Solutions would not have come to be without the brilliant collaboration of my dear friend and co-author, Dr. Marnie Loomis, who was a principal developer of the Burnout Shield system. She also wrote the very first article published on our Burnout Shield system: Not Just a Personal Problem, Practitioner Burnout is a Public Health Issue, published in Holistic Primary Care. 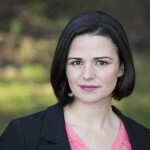 Dr. Loomis is a naturopathic physician in private practice. As a speaker, she is well known for her witty and engaging style. She has been a natural medicine expert for television, radio and print news outlets and has presented scientific lectures and comedy shows on the topics of health and burnout since 2007. 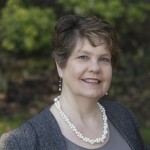 Dr. Loomis’s diverse resume includes business consultant, naturopathic primary care practice, managing editor for the Naturopathic Doctor News and Review (NDNR), departmental director for two college departments and instructor of several subjects at the National University of Natural Medicine (NUNM).